Great bakers rack/shelf for the kitchen. I use it to display my cookbooks and vintage kitchen collectibles. Super cute! Lots of compliments and people asking where we got it. Create a charming and timeless display in your kitchen with the Mandalay Iron 5-tier bakers rack by International Caravan Home Furnishings. 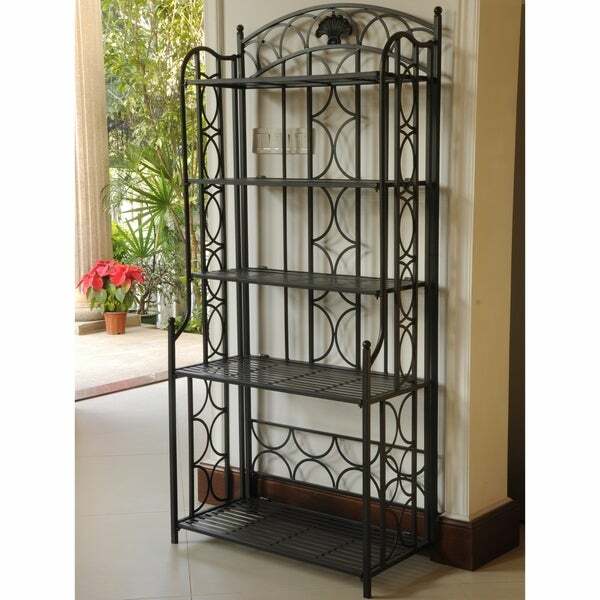 The lovely but durable rack is crafted from rich and durable iron with a moisture-resistant, powder-coated finish, and features a striking design with an arching top and ornamental sides. Perfect for almost any room in the house, the open shelf rack is perfect for cooling pies, displaying decorative dishes, or storing extra towels and supplies. This beautiful folding bakers rack in perfect for indoor as well as outdoor use and available in several finishes. Dimensions 31.0 In. X 3.0 In. X 69.0 In. 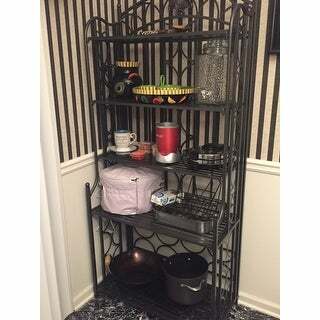 I hesitated a little bit at paying almost $200 for this piece when there were other baker's racks going for $100 on Overstock, but the description that it was completely made from iron and also already in one piece, very little assembly required (everything was already hinged together) is what tipped the scales for me. It also shipped for a few dollars and got to my home in less than 3 days from ordering it! THe box was VERY heavy but once I opened it up it took less than 5 minutes to get it standing and ready. However be warned that you do have to attach the very top shelf with some screws -- not hard at all -- but at first I thought the screws weren't included; but they are taped to the baker's rack itself in a very small black plastic bag that I couldn't see at first. This little plastic bag of screws should be a brighter color! Otherwise I love it and it handles my extremely heavy Le Crueset pots and pans, cookbooks and microwave really well. I can even hang hooks on the side to also hang frying pans off the sides. Not too wide but not too narrow either. Awesome purchase! I love the baker's rack. I thought I wanted it in white and I was going to paint it but the pewter is perfect with my tile floors in my new kitchen. I did not use the top shelf that was provided as I wanted to put a 17 inch TV on the shelf with the cable box on the shelf below. TV is just the right height and everyone thinks it looks terrific. I love this bakers rack! It fit exactlty in the space a wanted it for. The dark green is lovely, just be aware it is VERY dark green. The best part about this rack (besides only paying $3 shipping) is that it arrives fully assembled. With the exception of the top shelf, which needs to be screwed into place, you simply lower the shelves and go. The shelves are very sturdy and have not bent or warped even while holding my cast iron cookware. I had been looking in the stores, and found nothing that even came close. So to all those reading my review...stop looking and just buy it! This is exactly what I need for my kitchen. First of all, this rack is made of iron, very heavy and sturdy, well made and easy to assemble. And it looks very nice in the kitchen. I will expect it to last forever. The height and width of each shelf gives this rack flexibility to store variety of stuffs as needed. It seems to have enough room to fit whatever was clustered before. The bottom one is high enough to fit my rice bag, the middle one is good to fit the microwave oven. After I bought the first one, my kitchen looks much neater. And I went back to buy another one, now finally I have extra shelf space left open in my kitchen. I'm very happy with the product. INITIALLY, I WAS OVERLY SKEPTICAL. I THOROUGHLY AND OVERLY RESEARCHED, RESEARCHED, RESEARCHED AND SHOPPED COMPARED SEVERAL ONLINE RETAIL SOURCES AND THEN I VISITED EVERY RETAIL HIGH-END FURNITURE STORE WITH IN 20MILES FROM HOME. THIS BAKER's RACK IS A WIN WIN WIN WIN WIN WIN!!! I LOVE LOVE LOVE THIS BAKER's RACK!!! HIGH-QUALITY, WELL MADE, PRACTICAL IDEAL AND AN ABSOLUTELY MUST HAVE!!!!! DO NOT HESITATE NOR PROCRASTINATE LIKE A CRAZY PERSON; ME!!! IF YOU DESPERATELY NEED THE STORAGE SPACE FOR YOUR POTS AND PANS. I ASSURE YOU THIS IS THE PERFECT HIGH QUALITY DURABLE STYLISH BAKER's RACK OF CHOICE!!! YOU WILL NOT BE DISAPPOINTED AT ALL!!!! MY MANY MANY MANY LECREUSET AND STAUB COOKWARE PIECES LOOK ABSOLUTELY BEAUTIFUL SITTING UPON THIS IRON BAKER's RACK. I EVEN PURCHASED SOME POT RACK HOOKS AND HANG OTHER COOKWARE (FRY PANS) PIECES ON THE SIDE OF THE IRON BAKER's RACK. 😍😍😍😍😍😍😍 SUPER EASY ASSEMBLY. VERY VERY STURDY ON HARD FLOORS OR CARPET. The rack looks beautiful in my kitchen and the price is good. However, there is minor damage to the finish on one of the metal bars on the back. Since the damage is facing the wall and no one will ever see it, I plan to keep the product. I might use some touch up paint on the exposed metal. When I put the top shelf on, I had to put the "spokes" into the holes in front first. When I tried doing the hinge first, I was unable to get the spoke into the hole. One hinge went on easily, and the other I struggled with. I suppose leaving the top shelf off is the best way for the manufacturer to pack the rack. Otherwise the top shelf would rub against the decoration on the top while in the box. Even though I had a bit of a struggle with the top shelf, I still recommend this rack. It is very sturdy, looks really pretty, and matches my bronze kitchen fixtures. My apartment doesn't have a lot of kitchen storage so I purchased this rack to hold my Le Creuset cast iron pans. It's very sturdy and my pans look beautiful displayed on the shelves. I own several International Caravan items and the quality of all of them is excellent. Love this piece, perfect for holding many items without worry of tipping - every heavy, stable and safe to put in hallway. Color not what expected but love it's usage plus could always spray paint it easily to change to color. Looking for something that would hold a lot but not be too deep in inches - perfect for my space. As always, OS sent it quickly arriving undamaged. I would recommend this rack for use in a kitchen, laundry room, or on a covered porch for plants (with a tray to prevent water getting on the rack). It is sturdy, easy to assemble; and the shelves are both deep enough and far enough apart to hold storage baskets. Very sturdy bakers rack. We used both indoors and outdoors. Inside we used for baking ware and outdoors we used as a planter. It stood up to Florida, Idaho, and Washington weather. It also was durable enough to stand up to many moves. fits perfectly along side refrigerator in a very small kitchen and adds valuable space! There are cheaper racks available, but the few extra dollars for this one are well worth it! This is easy to assemble (just one setion needs to be added) and compliments have been forthcoming from friends. You won't be disappointed with this rack! 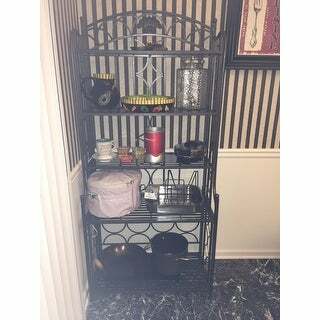 I love this rack and the way it has helped me organize my kitchen. Friends who have come in have also commented positively about it and like the way it fits into the space I have for it. I like that it is not too big and bulky for my kitchen but at the same time really holds a lot of stuff. I also like the color. My kitchen is open to the rest of the house and this color looks more like a piece of furniture than a professional kitchen. Great product: sturdy, attractive, spacious. Wonderful rack to add extra space in shelf-challenged kitchen. Sturdy enough to hold very heavy stand mixer and other appliances but attractive enough not to want to hide. I bought rubber chair cups to put on the legs to protect the tile floor, and now I can move the rack without worry. Highly recommend. this bakers rack was exactly what we were looking for. it is heavy, very stable and if you need to move it it will fold up nicely. Arrived in quick and in great condition. It’s sturdy and heavy. Fits perfectly in my space. The very top rack is the only one that needs assembly/attachment. If you need a shelf for taller items, you have the option to not attached the top shelf. All other shelves are already attached with screws. I love it! I ordered this to use on our back deck.i love that I can put plants on the shelves. I use the larger top shelf as a side table next to one of my chairs. This has been sitting outside in the CO sun and still looks great. Has held up to the heat and snow very well. I would definitely recommend this bakers rack. This was exactly what I was looking for, it came on time and there was nothing to do but take it out of the box and unfold it. The specs were perfect and it fits just where I wanted it to go. Easy to put together but didn’t hold up very well over time. Pieces broke off sort of easily. However it was easy to move because you can fold it up. Product delivered timely. Baker's rack is heavy, no scratches, easy to assemble, good product. I would totally recommend this! Thick iron and obvious quality! This is my second rack. Easy to pack away when Fall arrives. I put decorative pots on them to look cool on my deck. When I received this backer's rack, the box had been damaged in transit and had large, gaping holes, exposing the rack to outside moisture. The result was that, when I received it, it was actually rusted in several spots. I contacted OS (who was great), sent them pictures, and was given a replacement within a week. The reason for the less than perfect review is that the pegs for the top shelf don't align, indicating poor workmanship and also poor quality control. There is not way to align them, short of soldering them! I don't feel like going through the return process again, so I'm going to keep it, but I would not order this again. I love, but can only give three stars, one of the shelves does not fit into the socket. but this rack is sturdy and had tons of room, just what i was looking for for my small apartment. Looked for a long time for another bakers rack to set next to the one I have. they are perfect playmates. "What is the height of between the shelves? I have a small flat screen tv I would like to put on the third shelf from bottom." "I live in S. Florida will it hold up outside for my orchid plants?" As long as the paint does not get scratched. "Are the shelves solid or open? what are they made of? Wood? Glass? Wicker? Come combination?" They are open, metal, nothing wobbles. very sturdy, I have a heavy display of Le Crueset Cast Iron cookware on the shelves plus mush more. Hold a lot of stuff, I know I have more than 20 lbs on each shelf and it is stable and sturdy. Thank you for the shelf information. I went ahead and bought it without knowing if the shelves are open or not. I'm happy with it. The shelves come attached and just fold down. This is made of iron material. The shelves are strips of heavy duty metal, as you can see in the picture. Very sturdy, Very solid, and very nice shelf. "What is the maximum weight load capacity? Will it hold a Kitchen Aid mixer, along with other small appliances?" The weight limit is 20 pounds evenly distributed, per shelf, would be a safe weight load. "Can I set this up without attaching the top shelf so I can put taller items (ie instant pot) on the next to the top shelf?" Yes you can, just don't add the top shelf when you're putting the Rack together, it is extremely easy to assemble even without instructions. "How complicated is assembly? What tools are needed?" Not complicated. I think it was pretty much all one piece it folds up into itself. I think there was 1 shelf I put it and it just loses into slots/ holes. Very simple. I love this piece It's a great size and a very sturdy piece. "I can't find the width and height of the largest size, please help." There are different colors, but there is only one size for this unit. At its widest point it is 31 inches wide and it is 67" high. Find the perfect table for your small kitchen or breakfast nook. We'll help you decide which type is right for you. Careful thought and planning will help you get what you need and want from your small apartment, giving you the space you need to live your life to the fullest.